Thảo luận trong 'ENGLISH' bắt đầu bởi Jeff Loch, 9/8/18. It’s no secret that Thunderbolt 3 provides very powerful connectivity, but unless you made a full switch to the USB-C / Thunderbolt 3 world, most of the time, you’ll need an adapter to connect an external display, a USB 3.0 stick, or an Ethernet cable. To solve that problem, the team at CalDigit just released a new line of bus-powered docks—the Thunderbolt 3 mini Docks. Two years ago, Apple made the switch from Thunderbolt 2 to Thunderbolt 3 connectivity, and the recent updates to the MacBook line of course continue sporting Thunderbolt 3 ports. The nice thing about the Thunderbolt 3 interface is that it shares the same port type as USB-C. Furthermore, you can use USB-C devices and adaptors in a Thunderbolt 3 port, but not vice-versa. Thunderbolt 3 is faster than USB-C, and it gives you access to better display options up to 4K 60Hz (USB-C is limited to 4K 30HZ). And finally, Thunderbolt 3 allows you to charge your MacBook Pro. However, even if there are more and more options available, Thunderbolt 3 and USB-C devices are still at an early stage. You’ll often need an adapter to use what you already have or to extend your possibilities. For example, I bought a 2017 iMac that comes with 2 Thunderbolt 3 ports, 4 USB 3 ports, an SD card reader, a headphone jack, and a 10Gb Ethernet port. And that’s it. I was nearly stuck and needed an adapter to connect my external display and to give me access to more USB 3.0 ports. I went with a CalDigit TS3 Plus dock. It’s an amazing dock, perfect for a workstation, but it requires power from an AC adapter. It’s not ideal if you have to work on the road or if you don’t want to bring the power brick with you. 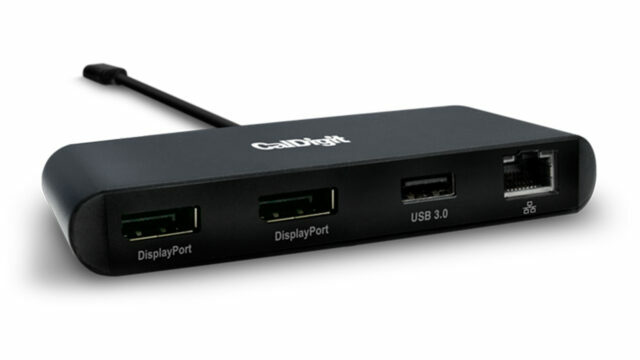 If you are in the market for a solution that is slim, lightweight, that comes with a built-in Thunderbolt 3 cable and doesn’t require an external AC adapter, CalDigit just released the Thunderbolt 3 mini Docks. 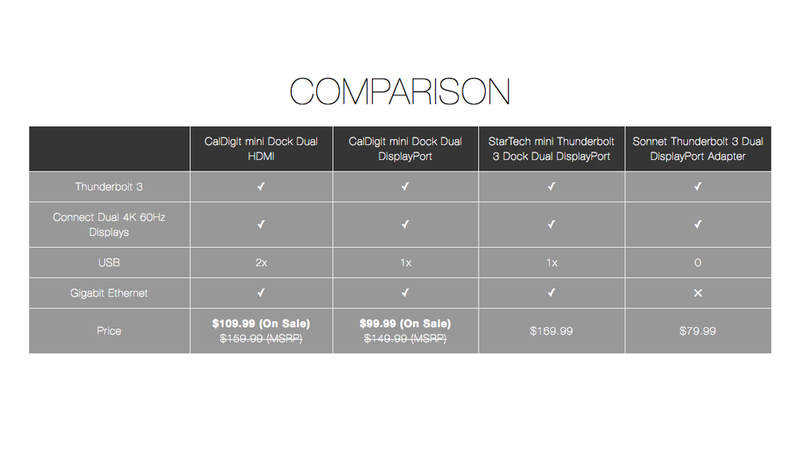 Two versions are available right now—a mini Dock Dual HDMI and a mini Dock Dual DisplayPort. 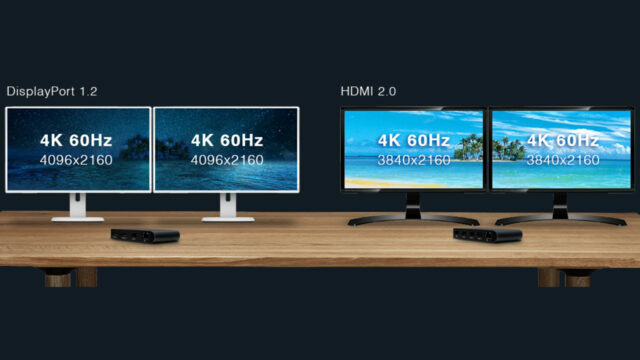 The mini Docks are Mac and PC compatible, and both models allow you to connect two 4K 60Hz monitors. It’s pretty amazing to have the ability to add two 4K monitors from just one cable. Also, there is a small difference between the two Docks. The mini Dock DisplayPort supports 4K output at a 4096 x 2160 (4K DCI) resolution, whereas the HDMI version is limited to 3840 x 2160 (4K UHD). 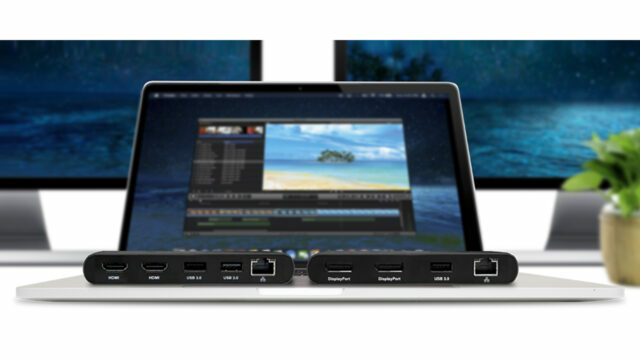 On top of that, with each mini Dock model, you gain access to a USB 3.0 port and a gigabit Ethernet port. On the HDMI mini Dock, there is also another USB 2.0 port. The only drawbacks of these docks are that you can’t charge your laptop, which can be limiting if you are out of Thunderbolt 3 ports. Also, you can’t connect another Thunderbolt 3 device to it, so you are better connecting it at the end of your Thunderbolt 3 chain. Of course, other Thunderbolt 3 docks are available on the market. So here is a small comparison chart. The CalDigit mini Dock Dual HDMI comes at $159, while the Dual DisplayPort version will set you back $149 – but it’s currently cheaper on Amazon. They are obviously not the cheapest docks out there, but CalDigit is known for making reliable products, and they pack quite a lot of ports for the price. Do you prefer using docks or adapters? Do those CalDigit mini Docks pack all the ports you need? Let us know in the comments down below! The post CalDigit Thunderbolt 3 mini Docks: Portable Docks to Bring Everywhere appeared first on cinema5D.